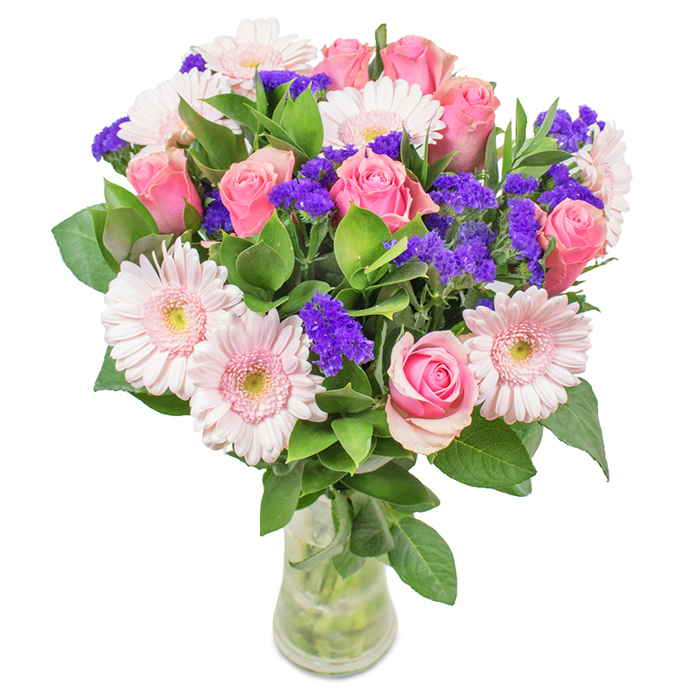 Can you think of a better way to show your love than sending an elegant bouquet of pink roses delicately accompanied by pink germinis, statice flowers and ruscus. A delightful bouquet that is both very stylish and fresh! The bouquet illustrated is Grand size. Wonderful way to surprise my mother in law for her birthday party. She was over the moon. That was the sweetest bouquet ever! All of the flowers were fresh upon arrival. I'd never ordered flowers online before but this florist turned out to be very reliable. 5 stars! Amazing flowers, the couriers delivered on time early in the morning. I'm very grateful for your service. Taking the time to express my appreciation to this company for the help when ordering this lovely bouquet. They were kind enough to take my order over the phone and deliver the flowers to my girlfriend's home. 5 stars quality of the service! Pretty pinkish bouquet, great combination of flowers. I just want to say how wonderful this bouquet actually is! It looks even better than the picture on the website. Online ordering was easy and very convenient. 5 stars from me! Wonderful selection of flowers! Called them yesterday to order this bouquet and they offered me the NEXT DAY delivery option which was very convenient. Today I received a notification that the flowers were delivered and everything was fine. The best service ever! Bought this charming bouquet from Handy Flowers for my wife’s birthday. They delivered on time and the bouquet was simply stunning!